The interdisciplinary Blue Engineering Course offers prospective engineers a look beyond their horizons and an (inter-)active approach to their social and ecological responsibility. This gives them the opportunity to become aware of their own values and reflect them with others. In addition, the teaching/learning process is essentially shifted to the students, so that they assume responsibility co-conducting own course and at the same time co-develop the whole course for the future semesters. All in all, the students complement their specialist knowledge from their regular study programs with orientation skills and competences that help them to know their role in terms of technology and society and to shape it together with others. analyze and evaluate the present reciprocal relations of technology, individuals, nature, society and democracy by taking different perspectives. Based on this analysis and evaluation, they are able to state their personal perspective and values of the reciprocal relations and act accordingly. cooperate with others to analyze and evaluate in a democratic process the present reciprocal relations of technology, individuals, nature, society and democracy. Based on their analysis and evaluation, they are able to work out a collective understanding with regard to their collective values and democratise the reciprocal relations. design their co-conduct their own course and contribute to the further development of the entire Blue Engineering Course. To raise awareness of and to facilitate discussion on the different aspects of social and ecological responsibility, the Blue Engineering-Group developed the idea of teaching units. These units - named building-blocks - are typically designed for one lesson of 60 or 90 minutes and address a complex issue, e.g. whistle-blowing, ethical codes, technology as problem-solver, social businesses and cooperatives. Through the use of a wide variety of teaching methods the learning outcome depends more on the students as individuals and as a group than on the teachers. Consequently, the people responsible for the course don't function as experts who lecture but rather as moderators of group- and learning-processes. In fact, students may even be included in teaching by letting them prepare and conduct a building-block for the rest of the class. In addition, building-blocks may easily be used by a group of engineers working together in a company for their own continued education. In the first phase of the block "Greenwashing or Decision Aids - Labels, Certificates and the like", the participants get to know the "seven sins" of greenwashing. Based on this, they develop in small groups creative advertisement for a fictional product by excessively using methods of greenwashing. The advertisement is presented to the entire group and rounded up with a brief discussion. In the second phase of the block the small groups work through brochures of widely known labels and certificates and discuss if they are reliable. The participants of the block "Technology as a Drama - Technology in Drama" read passages of "The Physicists" by Friedrich Dürrenmatt and "Life of Galilee" by Bertolt Brecht. In small groups they rephrase the key messages in their own words and use them to improvise small scenes. The small groups present their best scenes to the whole group and lead a discussion on their interpretation. One examplery building block is the Cat video - Material and social requirements of Technology. The activity consists of small groups identifying all the material and social conditions required to watch a video on the Internet. The participants recognize that technology today is extremely necessary and that there is a strong dependence between individuals and technology. They also learn that the material required have a long and short term impact. Moreover, the social requirements will show that a complex social structure is needed for an accessible technology. There are now more than 140 such modules, which are regularly used in the Blue Engineering Seminar and outside. They will are freely accessible on the homepage since June 2017. The TU Berlin is committed to promoting sustainable development in its mission statement and in the general study and examination regulations. In this sense, the Blue Engineering Course is a central contribution to teaching and has been offered every semester since 2011. On average, about 80 students take an exam each semester. Currently, it is placed as a compulsory elective module in the bachelor and master study programmes of mechanical engineering, information technology in mechanical engineering, transport systems engineering and industrial engineering. An extension to other study programmes is desirable. It is credited with 6 ECTS points. The Blue Engineering seminar is offered through the Chair of Machinery Systems Design. The module manager is Prof. Dr. -Ing. Henning Meyer. André Baier is responsible for the implementation as a teaching and research assistant. However, the course is essentially conducted out by three tutors, who carry out all core modules independently and accompany the participants throughout the entire semester. In the first phase, tutors carry out six core modules, so that the participants get to know the general character of the Blue Engineering Course as well as well as its content and didactic approach. The topics here include technology assessment, ethical codes, technology as a problem solver and the productive world view. In the second phase, the participants organise in small groups to conduct an existing building block for their fellow students. By doing this, they learn how to actively organise a demanding and meaningful teaching/learning unit that does not follow conventional teaching approaches. The topics here include:"Gender, Diversity & Technology", Stromopoly, Nuclear-Power-Anno Domini, Peak Everything,"Work, Society and Trade Unions", Automation vs. Good Workplaces, Virtual Water and Land Grabbing. These building blocks are taken from the list of over 150 existing building blocks. In the third phase, the small groups present a building block that they have newly developed over the entire semester. The topic and methods are usually set by the participants themselves. For quality assurance they receive feedback from fellow students and student tutors several times over the course of the whole semester. These building blocks are than added to the growing list of existing building blocks. the weekly learning journal serves for student’s own reflection and where the different topics over the course are connected and linked to. newspaper articles, conversation with friends or family etc. Approximately 90% of the participants state in the final survey that they will recommend the course to others. Approximately 50% of the participants therefore participate in the course on the basis of a recommendation. The proportion of female students is approximately 25%. Particularly noteworthy in this context, however, is the fact that the proportion of female students of mechanical engineering, information technology in mechanical engineering and physical engineering is 50% higher than the respective cohort. This suggests that the emphasis on ecological and social relevance can increase the attractiveness of engineering sciences. The quality of the modules developed by students is generally very high so they can be used outside of class without any hesitation. Many building blocks testify to a particularly intensive study of topics that are often (still) barely noticed by the general public. At the same time, there are seemingly no limits to the creative implementation through games, picturebooks and the like. The qualitative evaluation through interviews with students and the evaluation of the learning journals shows that this is mainly due to two factors. On the one hand, students are free to deal with a topic they choose and often have been dealing with for a long time. On the other hand, it motivates students in particular that their work will be used by other fellow students in the coming semesters to create challenging teaching/learning situations. In addition to a qualitative evaluation, the learning objectives are also examined by a quantitative evaluation, the core of which is a comparative self-assessment of competences. For this purpose, the 12 key competences for sustainable development are adapted as items of a questionnaire. The students are than asked to assess their competences at the beginning and end of each semester. In almost all items and in all 12 key competences, the participants show an increase of about 1 point on a 6-point Likert scale. Through an initiative of students, a Blue Engineering Course has been held every semester at the TU Hamburg-Harburg since 2012. There it is offered as a 2 ECTS point block course in the free elective area for all Bachelor's degree programmes and as a mixture of block seminar and a series of evening events in the Master's programmes. 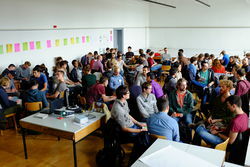 Since 2016, it has been offered at Hochschule Düsseldorf as a 5-LP in the compulsory elective area, whereby the course takes place every week in the first half of a semester and concludes with a weekend block in the middle of the semester. All in all, the three different course types show that the Blue Engineering concept can be flexibly adapted to the respective conditions at a university. Due to its modular character, which is designed for the re-use all elements, the course concept can be safely implemented at other universities. Baier A. (2013). “Student-Driven Courses on the Social and Ecological Responsibilities of Engineers”. Science and Engineering Ethics, 19, 4, 1469-1472. Baier A. and Pongratz S. (2013). “Collectively and Critically Reflecting on Technology and Society”. Proceedings of the 41st SEFI Annual Conference, 16-20 September 2013, Leuven, Belgium. Pongratz S. and Baier A. (2015). "Encouraging Engineering Students to Question Technological Solutions for Complex Ecological and Social Problems." Integrating Sustainability Thinking in Science and Engineering Curricula. Springer International Publishing, 2015. 375-386.